My PhD focuses on how artificial intelligence can be used in healthcare. My experiences to date have shown me both how valuable coding skills are to broaden career horizons, and that there is a lack of quality coding education in school. I didn’t learn any coding skills until university and I think that’s the same story for most people. To combat this, I decided to run Coding for Girls; a series of two coding workshops for local Girl Guides. My aim was to develop their interest, confidence and skills in coding. Over two workshops we covered the basics of coding using ‘Scratch’- a building block version of coding language developed by Massachusetts Institute of Technology (MIT), USA. I wanted to ensure that the girls developed the skills to create something independently and that they increased their understanding of what coding could be used for. I was surprised to find out that a lot of the girls already knew about artificial intelligence (AI), how it works and what it means. There was even a debate about whether replacing robots with doctors would ever happen and, if it did, whether it would be a good or a bad thing. It was really interesting to find out that these 10 year olds were familiar with such advanced technologies. During the first workshop, the girls completed all the activities on the computer. However, the Girl Guide Leader noted in her feedback that some individuals struggled to concentrate and were distracted from the coding tasks. It was really valuable to hear this, and we took it on board to develop a hands-on activity for the second workshop. During this task, the girls rearranged printed instructions to code a human robot- aka. one of them! This helped them to develop coding skills, such as, how to use repetition and decision making when writing a programme. As this session fell on St Valentine’s Day, their task was to programme robots to pick flowers and write poetry. One of my favourite moments was watching the two teams act out the coding in a ‘robot-war’ style! It was great to see everyone get behind their team and realise how easy it is for instructions to be mistaken or misinterpreted. If instructions weren’t quite specific enough, their robot went a bit haywire – that was really fun to watch! As there is currently a male dominance in the coding industry, I also wanted to demonstrate that women have been involved in coding throughout history. I told the girls about women such as Ada Lovelace, who developed the first computer programming language. We had asked the girls to draw what they thought a coder looked at the start of the first session and again at the end of the second session. It was fantastic to see that the drawings had changed from pictures of old men in glasses (!) to drawings of men and women in teams. That was a really rewarding moment, and made it feel like we’d achieved the aim of the programme. This was such a great opportunity for me to explore how best to engage students and young people with coding. In the future I hope to run a longer and larger scale project to encourage more young people to take up coding. Stay tuned! Dr Samantha Terry is a lecturer in Radiobiology and award winning public engagement leader. What started with a rather naïve application to the Royal Society Summer Science Exhibition, finished at a fancy evening event at the Francis Crick Institute for being awarded with the Outreach and Engagement Award as Established Researcher by the Royal Society of Biology . How could I say no to being lead exhibitor on the biggest event on the public engagement calendar, the Royal Society Summer Science Exhibition? (Especially if I could use the title “Hot Stuff” to explain our research at King’s College London and the Centre of Medical Engineering using radioactivity to image and treat disease). I have to admit: I was naïve when I applied. My public engagements until that point had been fairly limited and basic; I had taken part in “I am a Scientist – Get me out of Here”, Pint of Science, Soapbox Science and a Royal Society of Chemistry Public Lecture, all with relatively small audiences and simple activities aimed at one audience. However, in 2017, the Summer Science Exhibition figures showed that over 12,000 people attended and that the audience varied across the spectrum in both age and experience in the sciences. I started the 9-month planning process with getting funds. These were surprisingly easily obtained through the generous support of the EPSRC/Wellcome Centre of Medical Engineering, as well as the King’s College London Public Engagement Small Grant Scheme. Step 1: Consult many people in my network to discuss ideas around the key messages (1. Radioactivity is all around, 2. Radioactivity images disease, and 3. Radioactivity treats disease). Step 2: Set up a core project planning team to collaboratively plan, design and produce the exhibit stand and activities. We had two public engagement managers, two lecturers, a PhD student, a preclinical imaging facilities manager, a postdoc, the University Radiation Protection Officer, and a design student. Step 3: Set up workshops, talks and events to develop the stand (i.e. with primary schools and various patient and public involvement groups). We went to Brook House Primary School in Tottenham to engage with 2 classes, each with thirty 7-year olds and had sessions with both the BRC Patient and Public Involvement Advisory Group and Imaging Sciences Public and Patient Advisory Group, whose input was invaluable. For instance, an activity called ‘Be the Radiographer’ was scrapped as the groups felt it was too controversial: “[It was] too real and would remind me of the pain I went through” was one of the comments. Step 4: Plan activities. 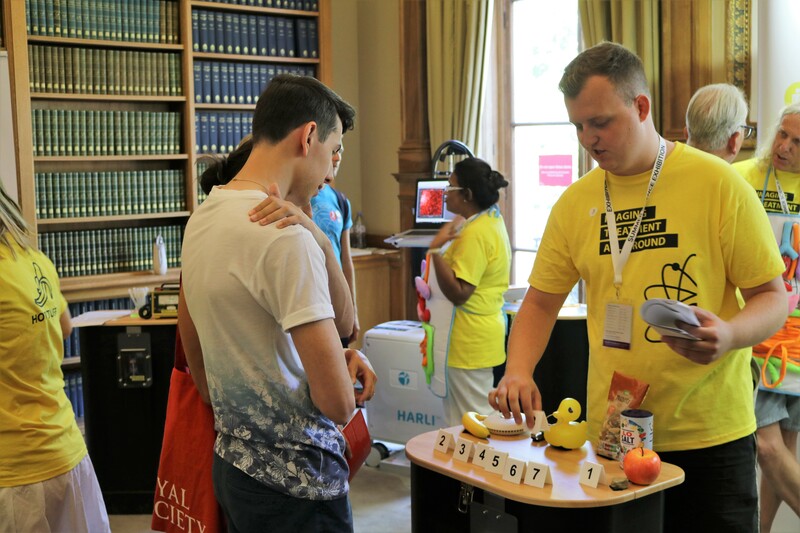 Activities included “Hunt the Unwell Organ”, an LED-based radiotherapy game, radiation time trial and a rap on radioactivity in bananas by biochemist Alex Lathbridge (Thermoflynamics). The apron/organ game was well received at the primary school having been named ‘epic’. Step 5: Promote our stand by any means possible. This included using Twitter accounts at the academic/departmental/school/faculty and King’s level as well as creating content on the King’s College London website. We also created a 2-minute introductory video of research from our Department that explains how our interdisciplinary research goes from synthesis of new imaging tracers and therapies (chemistry) to evaluation in cells and animals (biology) to finally clinical translation (clinicians, engineers, physicists). Step 6: Get volunteers. We amassed 54 volunteers (undergraduate, Masters and PhD students, postdocs, lecturers, Professors, Heads of Department and School, clinicians, medical physicists) to man the stand across the week. Also included was an undergraduate student whose stipend was paid by the King’s Undergraduate Research Fellowship Programme. Step 7: Train volunteers. Most participants attended our training on how to engage the public and tackle difficult topics as advised by representatives from Cancer Research UK and Understanding Animal Research. Also, a handbook was created with helpful information about the research we do in a larger context. Step 8: Evaluate success by an external person who observed and interviewed not just people attending the stand, but also the people involved in manning the stand. In summary, it was clear those involved in Hot Stuff, from the visitors, the project team, and the researchers, enjoyed it immensely. Hot Stuff not only led to an encouraging level of awareness and interest in radioactivity, but also in engagement itself. Furthermore, this report provides evidence to: a) support such activities in promoting the communication of science; and b) indicates there is potential, and demand, for the development of further engagement activities. Twitter engagements for key Twitter handles involved in promoting the stand saw on average over 40,000 impressions and between 700-1200 engagements over the course of the Summer Science Exhibition week. We were also interviewed on BBC Radio which further promoted not just our research, but King’ College London, too. Step 9: Carry on. As activities are well defined and set up, anyone can take part in any event with little notice or effort. 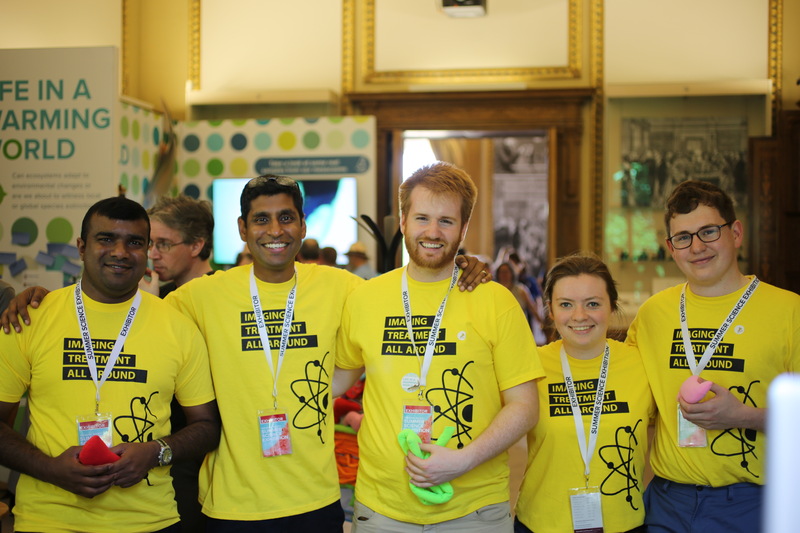 Several activities have been used since the Summer Science Exhibition, including at New Scientist Live, King’s Health Partners’ Summer School, and the RSC Chemistry at Work event in 2018. The activities continue to inspire academics and postdocs to include public engagement in their grant and fellowship applications. For our hard work in public engagement over the last few years and for having created activities with longevity, I have recently won the Royal Society of Biology Public Engagement and Outreach Award, which is a great accolade for our School to receive. It also showcases that public engagement is valued by prestigious societies; my recent shortlisting for a King’s Award, for example, demonstrates that King’s celebrates our involvement in this arena. We’ll continue to work in this vein, and make every attempt to make public engagement a part of researchers’ every day life. Dr Marta Varela is a Research Associate within the Department of Biomedical Engineering. On a daily basis, we talk about our work almost exclusively with other researchers for whom the excitement and novelty of what we do is taken for granted. I was delighted to be awarded a Public Engagement Grant from the Institute of Physics in January 2018 to give me the opportunity to build a series of gadgets that would allow me to share the excitement of my research with the general public. The main aim of the project was to demonstrate how the laws of physics underlie biological processes, particularly the propagation of the electrical signal that triggers the contraction of the heart. I was lucky enough to benefit from the invaluable hard work of Aditi Roy (PhD student) and Ali Tajabadi (BEng student) in this project. Together, we created a physical model of a cardiac arrhythmia: a 3D printed heart embedded with LEDs. The LEDs obediently lit up sequentially to demonstrate the activation of the heart in sinus rhythm, but at the flick of a switch, could light up in a complex and chaotic-looking pattern, as in a cardiac arrhythmia. As well as being illustrative of the complexity of an arrhythmia, this model was very visually appealing and we found it drew the attention of passers-by wherever we took it. Apart from elucidating the mechanisms of arrhythmias, our research aims to help clinicians design optimal treatment plans and we wanted to convey that message in our display. Ali therefore created an Android app where users can interactively test different strategies to terminate arrhythmias, simulating a widely-used procedure called catheter ablation. Give it a go and test your skills as an electrophysiologist: Cardiac Ablation Simulator App (Android devices only). We then took all these devices, together with a model of an electrical circuit that gives the same electrical output as a cardiac cell, to a few public events. The first was International Clinical Trials Day in the corridor of St Thomas’ Hospital, in the excellent company of other researchers working at King’s. I was impressed by the insight of some of the questions from the many patients and hospital visitors that stopped at our stall. The next day, we visited the Camden New Town Festival. Sadly, there was not much interest on the part of festival goers on our experiment, whose interest was drawn to the neighbouring stalls selling shiny attractive jewellery. (It did not help that one of the electrical wires in the LED heart snapped in the beginning, preventing it from lighting up.) I realised that, in this setting, the stall would need to be more visually attractive to draw visitors in, particularly children. It was a good learning experience. I will never again set up a stall in a public festival without being suitably armed with balloons, pens, stickers and colourful fliers (and some spare electrical wires…). It’s Monday morning, 8:30am, 2nd July. I’m at the Royal Society, surrounded by books – some over 100 years old – dressed in a bright banana yellow shirt with shorts and tennis shoes. Behind me, attached to a large backdrop, are a pair of similarly yellow headphones which will play a rap song when a similarly-still yellow button beside it is pressed. I’m at the Royal Society, where some of the greatest scientists in the world are members, and occasionally pop by for tea. Suddenly, Brian Cox, OBE FRS walks in. The story of how I got to be in that situation starts roughly six months earlier. “It’s called Hot Stuff”, I’m in a meeting in my research department, I’ve volunteered to take part in the organisation of a public engagement stand all about radioactivity: Hot Stuff. ‘Hot’ meaning radioactive. I chuckle at the pun. This will be a week-long event at the Royal Society where thousands of people will visit during that time. We’ve been tasked to put together various activities to explain to members of public about the research we do with radioactivity. My part is all about how radiation is everywhere and not as scary as it first seems. The other aspects cover how we use radioactivity to detect disease and to then treat disease. So over the coming months we all develop what becomes a really fun, interactive stand. I’ve put together a time trial in which participants rank everyday items (e.g. smoke alarm, bananas, Lo-Salt and brazil nuts) in order of how radioactive they think they are. Other activities include finding a radioactive organ upon an apron you can wear using a radiation detector, and an interactive game to teach people about the various ways we treat cancer with radiation. We test them on patients, parents, school children and colleagues and get lovely feedback and improvements to make. We design bright yellow shirts, with bananas and the words ‘hot stuff’ on them. The irony of wearing these shirts is not lost on me. Back to that Monday morning. Brian Cox is talking to another stand created by a charter school who won a competition. Their stand is all about ponds and the organisms that grow within them. They have a water tank containing various cool creatures – including a newt and an axolotl. Later in the week, the newt will escape and be found dried up and dead on the floor. He is picked up and becomes part of the exhibit. The whole week is a blast. The response is overwhelming and heart-warming. Everyone seems to love what we’ve done. I have fun, hilarious chats with people and then suddenly I’m talking with people who have cancer or have lost others to it. It’s humbling and interesting all at once. One day I spend an hour chatting to a young kid. We’re both just sitting on the floor. I’m wearing one of the radioactive organ aprons, my small intestine is hanging off. Another day I discuss cancer treatments with someone who has just finished their therapy. She looks at the interactive radiotherapy game we just played together, and tells me she now wonders whether she was given the right treatment or not. The week is made up of experiences like this. Some short, some long. Some forgettable, some quite the opposite, and the whole time I’m at the Royal Society in a bright yellow T-shirt that says ‘Hot Stuff’. It’s 8:45am on Monday morning. I never get to meet Brian Cox. He and his film crew have the footage they need of him with the schoolchildren and promptly leave without so much as a glance over at us at the other side of the room. My heart sinks ever so slightly, and I think about how weird Prof Cox’s hair looked: ‘were they blonde highlights?’ (in fairness he was quite faraway). By the end of the week, I’ve forgotten he was ever even there. I’m shattered, but the good sort of tired like you get after exercise. Euphoric pride. What a week. Dr Samantha Terry, Professor Alexander Hammers, Professor Andrew Reader, Dr Michelle Ma, Professor Phil Blower, Professor Seb Ourselin, Dr Tom Eykn, Professor Vicky Goh, Dr Samual Vennin, Alex Rigby, George Keeling, Giovanna Nordio, IB Hungnes, Joe Downey, Mads Iafrate, Megan Mitson, Peter Gawne, Rhiannon Evans, Saul Cooper. Thomas Langford is a Health Technology Assessor at King’s Technology Evaluation Centre (KiTEC), a research centre at King’s College London which conducts research into medical technologies on behalf of the National Institute of Health and Care Excellence (NICE) and other organisations. Rare Disease Day is an international event raising awareness of rare diseases, highlighting some of the research currently being conducted and how it will impact patients in the near future. This year, there were over 400 Rare Disease Day events around the world and one of these took place in St Thomas’ Hospital, London. This was the first time I had taken part in a public engagement event. I took part with my colleague, Jamie Erskine, who is also a Health Technology Assessor at KiTEC and we presented an upcoming research project we are working on about idiopathic membranous nephropathy, which sympathetically to anyone trying to pronounce it, is just referred to as IMN. It is estimated to affect between 60 and 90 people in the population of Greater London (that’s only 6-9 people in a million; which is very rare indeed). IMN is a disease which causes the immune system to produce antibodies that attack the kidneys. This means people with IMN gradually lose kidney function and end up requiring a kidney transplant or dialysis. Our project is running through NICE’s Commissioning through Evaluation programme, which allows specific patients access to promising, experimental treatments that are not currently available on the NHS. People with IMN in England are being offered a drug called Rituximab, which preliminary studies show might be beneficial for patients who are not responding well to conventional treatments. You can read more our work in this article on the Biomedical Research Centre’s website. St Thomas’ has just opened a fantastic new Rare Disease Centre treating rare complex and genetic conditions on a national scale. We toured the facility as part of the day and were amazed by how purpose-built and peaceful it was. Amenities such as family rooms and an outdoor space being developed into a garden show a level of care beyond that which is traditionally expected and will improve patient experience. The day also provided great experience in talking about our research to a range of audiences; patients, clinicians and fellow researchers while raising money for the Rare Disease Centre through donations and a cake sale. At KiTEC, we have a really diverse workload and are constantly collaborating with various clinicians and academics. Taking part in an event like Rare Disease Day is a great opportunity to meet researchers working in the Trust and hear about the excellent work they are doing, which may in the future, lead to further collaborations. There were a couple of hiccups on the day. Mostly due to the heavy snow, leaving our poster stranded at Guy’s Hospital rather than St. Thomas’! When the poster did arrive, it had been printed quite small in comparison to everyone else’s and the lateness meant space to put up our display was limited. Luckily, some very friendly nurses let us share their board. We also had a pair of kidneys 3D printed, but these turned out rather small too! All in all, it was a great experience meeting patients and finding out more about the hospital and the clinicians and researchers who support it. I would definitely recommend taking part in public engagement events as valuable experience in communicating your research to a range of audiences and gaining a new perspective on it. For the past 3 and a half months, researchers from King’s have partnered with School 21, a state school based in East London, to contribute to their Real World Learning Project. The Real World Learning Project is a work experience scheme designed to be more beneficial than the conventional school work experience week, and forms part of the school’s ethos that students should leave school equipped for the 21st century. The 11 students, aged 16-17, visited us every Thursday afternoon for 14 weeks and took ownership of small portions of research. At the end of their time with us we had a presentation day to share their results and experiences. The students chose one of four available projects that had at least one of our researchers who acted as supervisors. The projects varied: my students were trying to improve the resolution of ultrasound, other projects included simulating cardiac rhythm disorders; understanding Down’s Syndrome; and modelling cardiovascular systems; and. The amount of work they managed to achieve indicated the effort and enthusiasm they brought to the projects. Some highlights included: Aditi and James’s group 3D printing a model of the heart extracted from MRI data; Ana’s group making contributions to the databank of histological analysis of brain tissue; Sam, Jorge and Pete’s group unravelling factors that cause high blood pressure; and my group producing an ultrasound phantom that simulates microvasculature. None of these projects were created to occupy school students, they were genuine pieces of research and the outcomes will be incorporated into our future work. From my perspective, this was also a really exciting opportunity for us to do some public engagement with the future generation of scientists. Postdocs, lecturers and PhD students all contributed to the projects as we aimed to help the students get an understanding of what research at universities is like and inform their aspirations of futures in STEM subjects. We were particularly interested in doing an outreach project where students were active participants in the research. We were keen to follow this approach because research shows that young people have high aspirations regardless of socio-economic status, so interventions that can begin to raise attainment of students are of more value. The fact that the Real World Learning Project gave students the opportunity to do research with us over a longer period of time meant that they could develop new skills such as following laboratory protocols, and learn topics above what they would in school, like physiology, programming, and advanced mathematics. On the 25th of January we had our final presentation event. It was clear that the projects had been useful and fun for both students and supervisors. We hope to continue building our relationship with School 21 and use the experience to guide future outreach! Samuel Vennin is currently completing a PhD in cardiovascular medicine. His research focuses on establishing new relationships between blood flow and blood pressure in the ascending aorta. He works across both the Department of Clinical Pharmacology and the Department of Biomedical Engineering. Here he reflects on his experience in taking part in the Royal Society Summer Exhibition and New Scientist Live. In research, we spend a lot of time experimenting and creating knowledge to share it within our community. We ponder how best to convey our ideas to our peers, write specialist articles, give complex talks, design elaborate posters etc. The rationale for that is clear: to advance science, we need to communicate with those who are researching the same topics we do. This approach is undeniably efficient, but it tends to blind us and make us forget that sometimes, turning to a non-specialist audience can also benefit research. Over the summer of 2017, the School of Biomedical Engineering & Imaging Sciences and its Centre for Doctoral Training engaged in several public engagement events highlighting the research happening at King’s. At the prestigious Royal Society Summer Science Exhibition and the popular New Scientist Live, the stands we animated were mainly focused on the heart and showcased many of the School’s fields of expertise such as medical imaging, cardiovascular modelling and 3D printing for medical purposes. Over these two events we had over 5000 people visit our stand, from children to retired people – we even had a royal visit! For many of us, this was the occasion to have a different discussion about science. Have you ever tried playing tennis without a racket? Or if you really wanted to have a racket you would have to create one first? Public engagement in science gives you that exact feeling. You can’t assume you and your partner are playing the same game, nor can you use the tools you would normally use (the words, the concepts …) without explaining them first. If you both really want to play, it will require some effort and creativity. Volunteering on the stand at the Royal Society, (L-R) Jorge Mariscal-Harana, Myrianthi Hadjicharalambous, Sam Vennin, Elisa Roccia, Matt Allinson. That is what I love about engagement: it doesn’t come easy but if you manage to infuse your message, the intellectual reward is immense. You don’t talk about pacemakers to 5-year-old kids the same you would with retired people. Their understanding of heart mechanics is not the same, nor is their experience of cardiovascular disease. Therefore no two conversations are the same and if you have a prepared speech, you will quickly have to go off-script. This keeps you alert and ready to shift gears to better get your message across. It is different from teaching in university because instead of trying to bring students to understand an established and structured knowledge, here you have to tweak that structure to bring it to the person you are interacting with. It is a totally different intellectual dynamic. It is important for researchers to experience that dynamic because, as the saying goes, what is clearly thought out is expressed clearly and the skills gained through outreach activities hence translate nicely into the research world. Even when talking to an audience familiar with your field, like at a conference, most of them won’t know about your particular topic and its specificities. It frequently happens to me that I don’t understand talks from researchers whose field of investigation only borders mine. That is mainly due to the high degree of interdisciplinarity in the medical field as people come from backgrounds as diverse as electrical engineering, computing sciences, biology, chemistry or medicine. But if you can get a lay audience to understand your research, surely you can do the same with people who share some fundamentals with you. Being able to talk to all researchers will not only benefit the quality of the feedback you will get, but also gives you more visibility in the research community. One can never stress enough the importance of communication skills in research. The excitement of holding a beating heart! But there is more to engagement than personal fulfillment or achievement. When applying for grants or fellowships, a process in which funding bodies are looking for impact, showing that yours didn’t limit itself to publications in fancy journals or commercial applications can be the tie-breaker between you and another applicant. Having participated in public engagement shows that you are genuinely passionate about your research and spreading knowledge to the rest of the world, not just the people familiar with you field. Besides, some of the funding bodies are charities and can only fund research through donations. It is important for them to highlight examples of how that money is being used. This sparked some of the funniest interactions I had doing engagement: since I am funded by the British Heart Foundation, people were pleased to know where the money they raised running marathons went to! I hope this blog will entice more people to participate in such engagement activities. It is another fun and rewarding way to contribute to science. Kavitha is the Preclinical Imaging Facilities Manager for the School of Biomedical Engineering and Imaging Sciences. I found out about King’s Staff International Exchange Programme at a Professional Services Staff Mentoring Scheme lunch mixer in 2016, whilst chatting to a fellow attendee. I had always hoped to be able to visit the company InviCRO LLM (Boston, USA) which developed one of the software packages we use within our School for preclinical image analysis. I had come to know various members of the InviCRO team over the past 8 years following their inception and through our evolving relationship as we used their software ‘Vivoquant’. I had also been interested in the research conducted at the University of Pittsburgh as their interests, choices of radio-isotopes and disease targets for imaging closely aligned with our own. At the end of May 2017, one month after submission of my application, I found out that I was one of the fortunate to be selected by King’s Worldwide. At this point I had already made contact with both UMPC Pittsburgh and InviCRO and had identified hosts who were willing to welcome me to their respective institutions. I decided to travel to the US in September 2017 and promptly booked on an Icelandic airline called ‘Wow airlines’! In spite of its exuberant name, purple airplanes and purple-dressed cabin crew, the flight were straight-forward from London to Pittsburgh via Reykjavik…sadly Iceland was having a heatwave (8 °C) and so there was no snow to be seen from the aircraft! Pittsburgh was a lovely green city filled with tall conifers, green spaces and enjoying unseasonable temperatures of 27 °C. During my two days there, I visited UMPC Presbyterian hospital and had a tour of their PET centre, Siemans cyclotron, radiochemistry labs, and multiple scanners. I had the pleasure of meeting various personnel ranging from Dr Scott Mason, Dr Jonathan Carney, and Dr Brian Lopresti, who were able to describe to me the differences in regulatory structures in the USA for preclinical and radiation work and the workflow from PET isotope production to patient administration. During my visit a new Mediso PET/CT scanner was being acceptance tested and I got to see how this scanner design differed from ours at King’s which was exciting. I also got to meet Prof Carolyn Anderson, Dr Barry Edwards and their teams at UPMC Hillman Cancer Centre and toured their facilities and shared our common practices and differences. They had an interest in acquiring the Vivoquant software which we use at King’s and I was able to very quickly demonstrate to them some of its functionalities using their trial version. Happily I was going to visit InviCRO in Boston and so was able to ensure they got introduced to the correct people at Invicro who could help them evaluate the software. Moving on from sunny Pittsburgh to Boston was a little difficult. Stormy weather delayed us taking off from Pittsburgh as there was poor visibility for landing in Boston and we arrived well past midnight. The following day, I was due to attend the Invicro User meeting and by some lucky coincidence I had booked to stay directly opposite the meeting venue! I was warmly welcomed by various members of the Invicro team and got to put faces to the names of colleagues with whom I’d had emailed and spoken to via telecon over the years. My presentation was well received and whilst it was a little daunting to have my presentation broadcast live to other Vivoquant users around the world, it was great to be able to reach out to fellow scientists via technology. I met with other speakers and attendees from around the US and straight away exchanged thoughts, ideas and contact details. I had dinner my hosts Ciara Finucane, Whitney Woodson and visitors from Invicro London (previously Immanova – acquisition officially announced a few days prior to my visit). I had a pleasant evening with amiable company and an invitation to visit Invicro London upon my return to the UK. On my final day in Boston, I spent time at Invicro headquarters and visited their labs, saw their novel instruments, chatted with particular specialists regarding the software, certain hardware equipment which we at King’s might be interested in using and the possibility of Invicro hosting a user meeting in the UK, now that they had a strong presence in London. All in all, I was well taken care of by all my hosts and felt I had something to offer whilst learning about the different scientific challenges, laboratory setups, research environments and workflows in the US. I would recommend the King’s Staff International Exchange Programme to all my colleagues here at King’s as this has been a fruitful and rewarding experience. I have returned to the School of Biomedical Engineering and Imaging Sciences feeling very fortunate that I work in such a vibrant and exciting environment and feel renewed in my enthusiasm of our multidisciplinary, problem-solving and forward thinking ethos! Dr Ana Baburamani is a Research Associate working in the Centre for the Developing Brain, Department of Perinatal and Health at King’s College London. Ana hosted two students over the summer of 2017 and here she reflects on the experience. Over the summer I hosted two students who were on a Nuffield Research Placement. Over 5 weeks they came to gain research experience and run their own mini-research project. The students were intelligent, very enthusiast and had a keen interest in going on to do science at University. This was the first time I had hosted students but had always heard very positive things about getting involved. So, what is a Nuffield Research Placement? Nuffield Research Placements are aimed at students going into year 13 that have an interest in STEM (Science, Technology, Engineering and Mathematics). Nuffield also strongly encourages applications from students who don’t have a family history of going to university or who attend schools in less well-off areas, and provides travel bursaries for all students. My interest in wanting to get involved as a project provider was because I think it’s really important to be able to provide opportunities for students from all backgrounds (who may live in disadvantaged areas and may not have the chance otherwise). These placements can also help them get into university. I also felt it’s nice to be able to give students that are interested in a career in science a chance to have some practical work experience and see what it is really like working in a lab. It was only after I did a summer research placement during University that I realised I enjoyed research, so highly rate the experience. So what did they do and how did it go? Our research project is aimed at understanding brain development in Down Syndrome (DS). DS is the most common genetic cause of intellectual disability, but we have little information about the underlying neurobiology and what happens in early life. Here, the students assessed development of the cerebellum in a mouse model of DS. To do this I taught them basic histology and immunohistochemistry techniques that we routinely use to visualise brain sections, and label different cells or proteins. The two students, from two different schools across London, who hadn’t met each other before, got along great. They learnt the techniques, stained tissue sections, used microscopes to take the images, then measured and quantified the distribution of neurons and astrocytes in the developing cerebellum. It was a very successful project, and I think they both really enjoyed working together! The data they generated is very useful as it acts as preliminary data for me that we are now exploring further. What did they and I feel about the placement? The students enjoyed seeing different aspects of research. In addition to working in the lab, acquiring data and writing a research report, they had time to observe some of the clinical research which goes on in our Department. These students were incredibly bright and asked some great questions so it was very motivating for me to discuss the project and research field with them. The students are now going to submit their projects for upcoming science competitions, so we are currently helping them to prepare their applications. To be able to share my enthusiasm for research and hopefully inspire the next generation of students to pursue their interests in science makes hosting a Nuffield Research Placement student really rewarding. I would definitely be keen to be involved again next year. Last Friday, our 265th iFind volunteer arrived for her ultrasound with her partner and their chirpy two-year old daughter in tow. Once the scan started the little girl sat quietly with her father, slightly disinterested, even when he pointed out the face of her soon-to-be baby sister on the ultrasound screen. It wasn’t until we pulled open the blinds at the end of the scan, revealing the River Thames glistening between Westminster Palace and London Eye, that her apathy finally subsided and she bounced up and down with glee. Why am I telling you this? So two-year olds don’t care much for ultrasound scans… got it. Well, there’s a little more to this story. You see, that little girl had been in this room before – and she definitely didn’t have the same response when the blinds went up the last time. Her mother (iFind participant number two hundred and sixty-five) was actually volunteering for iFind for the second time, having previously been iFind participant number… five. Yup, that excitable little two-year old had once been the unborn face we glimpsed on the ultrasound machine, right back at the very beginning of our project. Cool right? We thought so too. In fact, it was a pretty fascinating reminder of how much time has passed since we started over three years ago, and a good opportunity to reflect on how far we’ve come since then (which, it turns out, is a long way). But more on that later. Firstly, a reminder of where we’re going: we are developing a fully integrated system of robotics, ultrasound, and computing that can automatically acquire and analyse the diagnostic imaging needed to detect fetal abnormalities. Yes, it’s ambitious; and no, we’re not (quite) there yet. But working with iFind is a bit like a mission to the moon: it will be exciting when we get there, but it’s just as exciting watching the incredible new technologies we are developing along the way. OK then, what have we achieved? Well, for a start, we have built on the routine screening ultrasounds from thousands of our iFind 1 volunteers to help inform this incredible automatic image detection software, designed by my colleagues Christian Baumgartner and Bernard Kainz using clever machine learning algorithms. My clinical colleagues Caroline Knight, Jackie Matthew and Tara Fletcher are already investigating the ways in which this might be useful to the teams performing routine antenatal screening scans, and by combining this software with the detailed tracking data from our iFind 2 volunteers – as demonstrated in this video from my colleagues Nicolas Toussaint and Alberto Gomez – we are starting to develop the backbone of the software that will guide the robotic elements of the final system (which, as my colleagues James Housden, Yohan Noh, Shuangyi Wang and Davi Singh will tell you, is amazing… but also top secret – for now. Sorry). From the MRI side of things, iFind volunteer 265 means we’re now over half way to our target of 500 complete fetal MRI scans, providing detailed imaging of the fetus to develop our final “atlas” of normal fetal development, being generated by Tong Zhang. We have seen some incredible yoga moves, some (technically flawless) moonwalking… and some babies just asking us to keep the noise down up there. In the last few months Jackie also completed her research looking at fetal weight, and we can now routinely report the fetal volume and weight in some of our MRI scans. In the area I am interested in – the fetal heart – Josh van Amerom has published these excitingly detailed video loops of the fetal cardiac motion, with more developments in the pipeline. And finally, by using MRI with motion correction techniques, my own research is already providing useful diagnostic information for real patients at St Thomas’ hospital, helping our clinical colleagues to provide the highest standards of care. So there you have it. 265 patients in and we’ve come a long, long way. It’s thrilling to think where we might be in another three years. When I was told that I may have scanned that little girl before she was born, I joked, “Ah! I thought I recognised her”. I didn’t, of course. But the way things are going with iFind, one day… who knows?